We typically view vegetarians and vegans as having a small body mass and lacking strength. 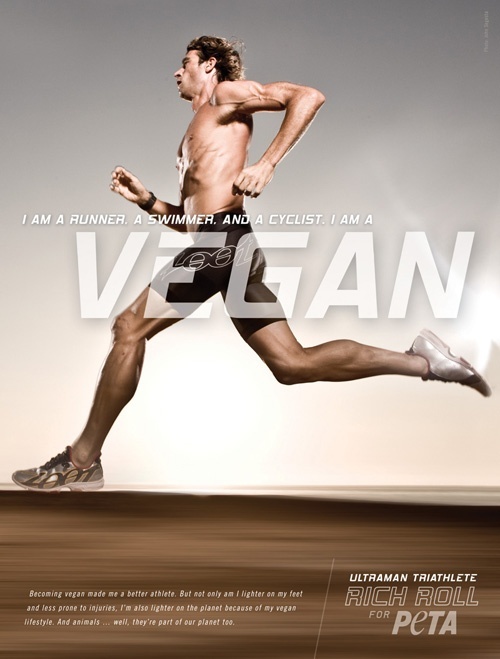 This profile may make it difficult to picture vegetarians and vegans as high-performing athletes. However there are many famous vegetarian athletes: football player Joe Namath, boxer Mike Tyson and tennis player Venus Williams to name a few. Is it possible for an athlete maintain their muscle mass without eating meat? How can they meet their nutritional needs while being meat free? 1) Can a vegetarian diet support gains in muscle mass or protein synthesis during resistance training as well as a non-vegetarian diet? Preliminary, short-term research suggests that, among previously untrained men, following a well planned lacto-ovo vegetarian diet while undergoing a resistance training program supports increases in muscle strength and muscle fiber size just as well as when following a non-vegetarian diet. Among non-vegetarian, recreationally active men, there is some evidence that suggests that consumption of cow’s milk, whey protein, or soy protein/beverage after resistance exercise training sessions enhances the anabolic response in the short and long term, but that cow’s milk may do this more effectively than soy. 2) Do vegetarian diets support optimum athletic performance? There is currently little evidence on the effects of a vegetarian diet on athletic performance. However, most accounts suggest that a vegetarian diet that is well planned and meets energy and nutrient needs supports optimal athletic performance as well as a non-vegetarian diet. It is possible for a vegetarian athlete to meet their protein needs! All foods except oils and sugar contain some protein. However plant proteins aren’t as well digested or as complete as animal proteins, so choosing a variety of different types of protein foods over the course of the day is essential. Since plant proteins aren’t as well digested, it is recommended that vegetarian athletes consume more protein than non-vegetarian athletes: 1.3 to 1.8 grams of protein per kilogram of body weight daily (this is 10% more than recommendations for non-vegetarian athletes). You may have heard the term complete protein before. A complete protein source is one that provides all 9 essential amino acids. Animal-based foods (meat, poultry, fish, eggs, and dairy products) are complete proteins. Many people believe that animal-based foods are the only source for complete proteins – but they’re not. Quinoa, soy, chia seeds, and hemp seeds are plant-based complete proteins. An incomplete protein source is one that is low in one or more of the essential amino acids. Complementary proteins are any two or more incomplete proteins that can be combined to provide all of the essential amino acids. For example, take the vegetarian mainstay of rice and beans: rice is low in the amino acids that beans are high in, and high in amino acids that beans are low in. Together, they provide all 9 essential amino acids. It was once believed that complementary proteins must be eaten during the same meal in order for the body to be able to use them together as a complete protein. But, because of the way the body breaks down proteins into their amino acid building blocks and stores them away for later use, it is now recommended to eat complementary proteins within the same day, but not necessarily the same meal. Let us see how plant sources size up to meat and what we can consume to meet our protein needs as a vegetarian athlete. Vitamin B12 is found naturally only in animal products. If you don’t eat eggs or dairy products, include foods fortified with vitamin B12 like soy beverages and meat substitutes, such as veggie dogs or veggie burgers. Dairy products or fortified soy beverages, canned salmon or sardines (with the bones), and some fortified orange juices provide both nutrients. Almonds, figs, beans, tahini, tofu set with calcium, turnip or collard greens, broccoli and kale also provide good amounts of calcium. Vitamin D is made when the sun hits bare skin. In the late fall or winter in Canada, our bodies can’t make enough vitamin D from the sun. If you train indoors most of the time, you may be at risk for low vitamin D and supplementation may be necessary. Experts recommend that ‘at risk’ athletes aged 19-50 years supplement with 200 IU of vitamin D daily. Eat iron-rich foods every day. Choose from beans, lentils, seeds, soy, and whole grain or fortified cereals, breads and pastas. Include a source of vitamin C at meals and snacks to help your body absorb the iron from plant foods. Examples include citrus fruits, strawberries, bell peppers, and broccoli. Don’t drink tea or coffee during meals because they can inhibit iron absorption. Wait at least one hour after a meal to enjoy your tea or coffee. Vegetarian athletes should have their iron checked periodically by their doctor to determine if a supplement is needed. Taking iron supplements without having your blood checked first is not a good idea. Too much iron from supplements can be toxic. Next Lentil Granola Bars – A Hidden Healthy Snack!